I like to think that writer-director James DeMonaco was originally trying to write a standard home invasion thriller to sell to several Hollywood studios, and in a half-serious attempt to explain the plot hole of why the house occupants don’t simply call the authorities, a light bulb struck above his head. This – we’re speculating – was how the concept of The Purge was born, and to everyone’s surprise, the idea of all crime being legal for 12 straight hours, with no police or hospital on standby, leaving everyone to do whatever the hell they wanted, from looting to murder, had enough juice to sustain not one, not two, but three movies by this point. First, a quick sum-up of my thoughts on the previous two: The Purge is definitely the weakest, and like we said it’s just a standard home invasion movie that happens to have the most ludicrous and nonsensical context surrounding it; meanwhile, I felt The Purge: Anarchy to not only be a major improvement on the last film, but the one that probably took the most opportunities that came with this set-up, and was thus allowed to have more fun. Now, with The Purge: Election Year, I feel that the series is definitely beginning to find its groove by displaying some of the loopiest on-screen violence of the series so far, while also having its footing a little too much into reality for its own good. The set-up this time sees us returning to a dystopian America during – what else – election year, with Senator Charlie Roan (Elizabeth Mitchell) gaining traction in the polls for her strong anti-Purge rhetoric. This provokes the New Founding Fathers, a collective group of old figureheads that are running this new totalitarian society, and they seek to use the forthcoming Purge night to do away with their political enemy. However, when a home-based assassination attempt fails, Roan and her head of security Leo Barnes (Frank Grillo, reprising his role from the previous film) are forced onto the streets where they must survive not only the government-hired mercenaries targeting her, but also the endless amounts of “Purgers” who are running wild on the streets of Washington D.C. causing all sorts of murderous mayhem. While I think out of all three films thus far Anarchy is probably my favourite, Election Year comes in at a close second, because although it lacks the quick pacing and sheer brutality of that one, this film has a lot more enjoyably silly moments to make it worthwhile enough for a decent viewing. Of course, to say that the concept of the Purge in and of itself is stupid and makes little to no sense is quite an understatement, but at this point I think they’ve finally caught on to its inherent silliness and are just asking us to go with it, unlike the first film which took its out-there ideas far too seriously. With this in mind, DeMonaco presents some of the most insane imagery and ideas of the films so far, such as “murder tourists” coming in from other countries to kill on Purge Night, cars completely decorated in luminous Christmas lights (how the driver can see anything in those conditions, I haven’t the foggiest), and Purgers’ masks resembling historical American figures that look like cheap pound-shop variations on Spitting Image characters. They are all entertainingly unhinged, something that even a handful of the actors manage to convey in some of the most over-the-top performances I’ve seen so far this year (Kyle Secor, as Roan’s ministerial political rival, is an absolute hoot, especially in the third act of this movie). Grillo continues to be awesome in a reprisal of his lead role from Anarchy, but even though this is his second appearance in the series you really don’t need to see Anarchy to get the full picture; like both movies prior, this is almost a standalone film which gives you all the details you need to know about the characters and the situation they’re in within seconds. That said, it’s probably useful to at least know a little bit of the actual Purge concept before going in, otherwise you’ll probably be a little lost. That didn’t necessarily happen for me, mostly because I saw both previous films before seeing this one, but it’s worth pointing that out to anyone who’s curious about seeing their first Purge movie. I will also say to anyone who does watch this without seeing the others that the pacing is probably better in at least Anarchy; here, certain scenes tend to go on for a bit longer than they need to, and although it’s only 109 minutes long, it can feel a lot longer at times, even if you’re having fun with it all. The violence definitely plays a large part of this movie, as it has done with all Purge movies to this point, and once you get past the psychotic lust for blood and destruction that creeps inside all of us, you have to admire some of the creativity that has gone into some of these on-screen deaths, like a giant guillotine constructed in an alleyway, or even a climactic midnight mass inside a church that, if you know the series, is probably exactly what you’re thinking. It’s part of The Purge’s identity, and whether or not you can get past its dumb set-up – which I would express genuine shock if it wasn’t the case I detailed in the opening paragraph – it’s an enjoyably silly time. 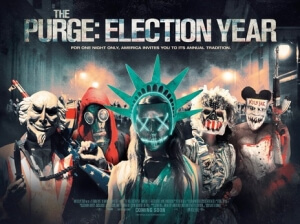 The Purge: Election Year continues the series’ entertaining lust for over-the-top violence, mostly succeeding in making us forget about the absolute ridiculousness of the main concept, with this entry in particular revelling in being as silly as possible with some fun on-screen deaths and some wildly and unintentionally funny acting.